see there’s your proof of global warming right there mister… last year, frozen. this year, not frozen. what’s warmer? that’s right not frozen. case closed. Did you notice that last year there was a “road closed” sign but this year there wasn’t? 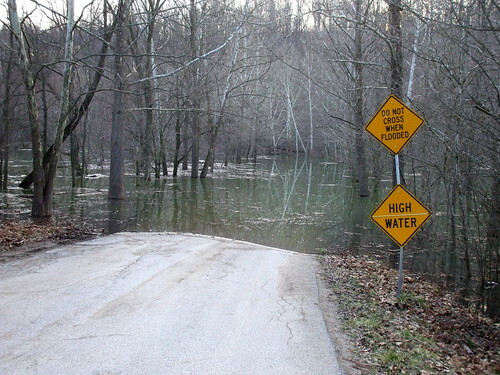 The reason Moore’s Creek wasn’t on the list is because it isn’t actually closed. You can paddle through anytime you like. We have gotten an inordinate amount of rain this year again. Put me down as a “yes” for closing that road. Temporarily anyway. Good to hear that the flooding isn’t too bad around you. Sounds like the midwest got hit pretty badly – and that it’s going to get worse with the snow meltoff. 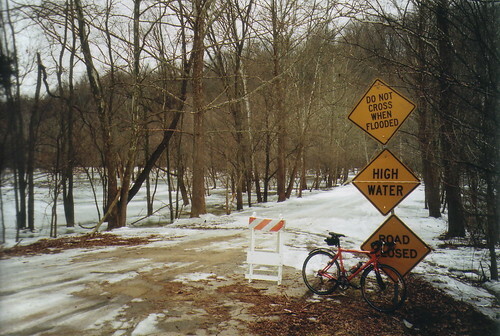 Stay safe and don’t bike through raging rivers.